Just a girl, married to Ted, leading a very crazy life one day at a time (most of the time feeling like the nutty professor). She has been the Art Director and “idea guru” behind Art Gone Wild since its start in 1994. 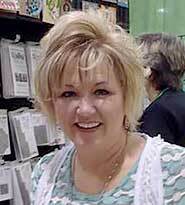 Her work has been featured in several national stamping and scrapbooking publications. In addition to leading the creative team at AGW, she is the mother of two wonderful children - Trevor and Katie. Follow Michelle on facebook for her latest stamping news.